The gaseous radon which comes out of the ground transforms within an hour into lead 210. 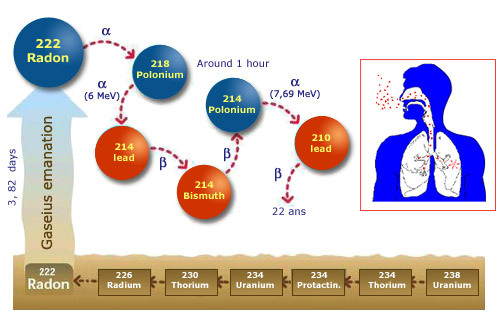 During this hour an atom of radon will first transmute into several intermediate elements, some of which can deposit on tiny particles and enter the lungs if inhaled. Two of these radioelements, polonium 218 and polonium 214, emit alpha rays: the most dangerous form of radiations on direct contact with living matter. Radon is a radioactive gas that is found in the atmosphere in minute quantities. Should it be inhaled, however, radon could be the source of radioactive decays inside the lungs. Its solid descendants can be fixed themselves to the body and irradiate the most sensitive cells of the bronchi. In 1987 the WHO (World Health Organisation) officially identified radon as a source of lung cancer in humans. The risk estimates made about radon are all drawn from old studies carried out on workers in uranium mines. These studies established that a greater exposure to uranium increased the risk of developing lung cancer. In today mines, adequate ventilation systems have greatly reduced the correlation. This map of the French departments shows the average radon concentration in buildings throughout France. As useful as such a map can be, it skims over the variations that can exist between neighbouring villages and even neighbouring houses. For instance, in some departments the concentration can vary from several becquerels per cubic metre to several thousand becquerels per cubic metre. A decree foresees compulsory measurements of the radon concentration in public places every ten years. According to the measured concentration, corrective actions should be taken in these buildings and buildings under construction. Radon has the peculiarity of being the densest gas found in nature. As a result it tends to stay near the Earth surface, and will accumulate in closed structures such as houses and especially cellars. Vigilance is of course necessary, but radon is a natural source of radiation from which we can protect ourselves. The concentration of radon in air is measured in Bq/m3, units which define the number of radon nuclei disintegrating per m3 every second. The average radon concentration in a French home is 90 Bq/m3, compared to 20 Bq/m3 in an English home and 108 Bq/m3 in a granite-rich country such as Sweden. As a lung carcinogen, radon comes as a distant second to tobacco as the primary cause of fatal lung cancer. It is estimated that an exposure to as high a dose as 3,000 Bq/m3 would have a similar effect to smoking 20 cigarettes per day. Seeing as the average concentration is only 90 Bq/m3, the average Frenchman can expect to be exposed to the equivalent of 0.6 cigarettes every day. The average risk is generally very low but these averages conceal a great statistical variation: one person in a hundred will live in a house where the radon concentration exceeds 1,000 Bq/m3. In order to evaluate the public exposure, the French radioprotection agency IRSN has been measuring radon concentration in homes around the country. Whatever the type of building (house, school or workplace), the only way to tell if there is a high radon concentration is to have measurements carried out by specialist organisations. 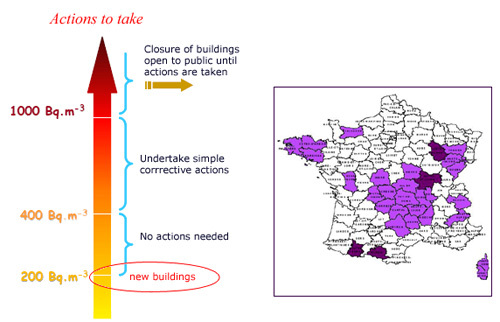 On the basis of these measurements, there are around 300,000 buildings in France where the average annual exposure exceeds 400 Bq/m3, of which 60,000 buildings have an average annual concentration exceeding 1,000 Bq/m3.